Batman Arkham Knight won't be out this winter after all. Warner Bros. Interactive Entertainment revealed today that Rocksteady's latest game will actually be out several months later. Arkham Knight will launch on June 2nd worldwide. That's a whole lot later than I expected. Retailers like the Microsoft Store were estimating a February launch. 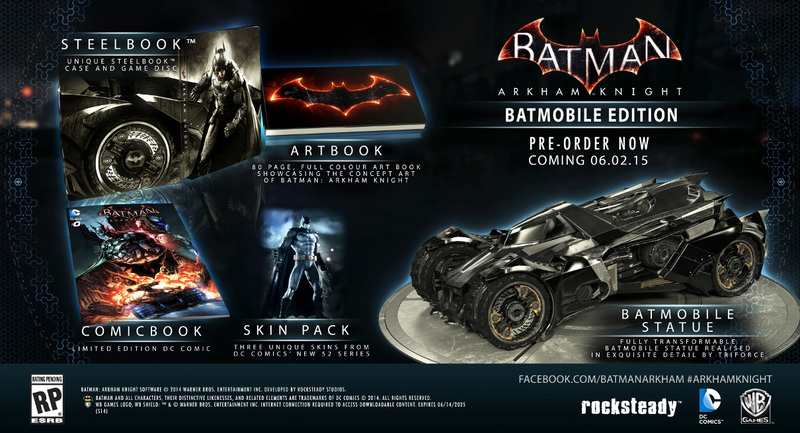 Looks like Rocksteady wanted some extra time to polish up the game. 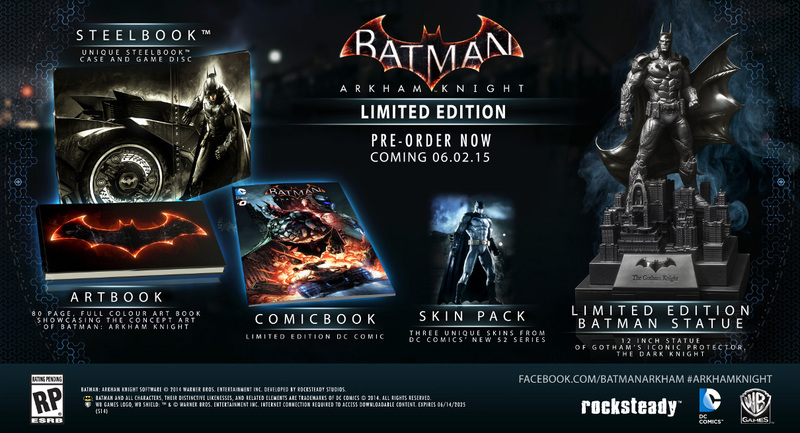 WB and Rocksteady once hoped to release Batman Arkham Knight by the end of 2014. They confirmed in June that they wouldn't achieve that goal, though. "Now Batman: Arkham Knight is totally awesome," Rocksteady's Dax Ginn said at the time. "The thing about awesome, though, is awesome takes time. And totally awesome takes a lot of time. So in collaboration with our colleagues at Warner Bros Interactive Entertainment and DC Comics, we have decided to extend the development time of Batman: Arkham Knight." The Limited Edition will be available in North America, Europe, Australia and New Zealand for PS4 and Xbox One. Each of those territories except North America can also purchase the bundle on PC as well. The PC version costs 99.99€ / 74.99£, while the PS4/Xbox One versions are priced at $99.99 / 119.99 € / 89.99£. Photos of each Collector's Edition are below. The statues are really impressive. Not impressive enough for me to fork over that much extra cash for the game, but still.